"Molly" has decided that super-powered beings are a threat not only to the Earth, but the universe itself, and henceforth, they must be destroyed. The League repels the respective threats, with Superman delivering the decisive blow. However, Molly laments that the League has done nothing but make impending doom that much more of a certainty. The finale of "Timeless" leaves plenty of questions, but only two that require answers. Since 2011, the DC Universe has been under the threat of some sort of Crisis. 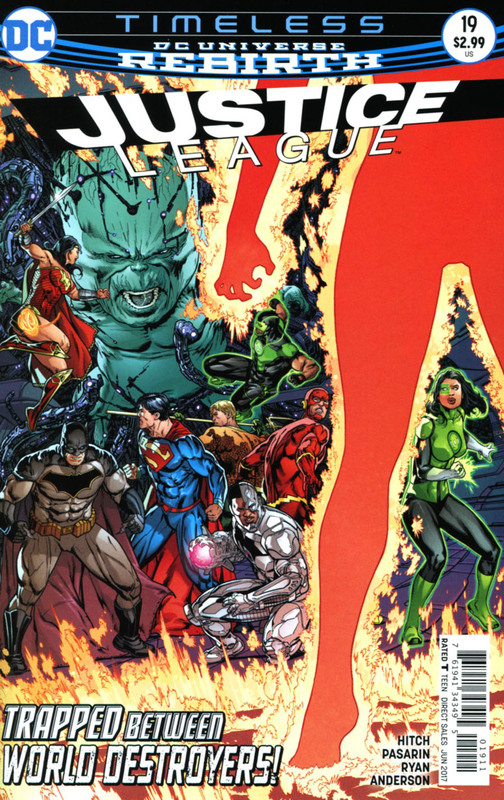 Flashpoint resulted in the merging of the DC and Wildstorm universes, but out necessity rather happenstance. Convergence came next, and after much peppering, the Darkseid War. Rebirth revealed that the New 52 universe was flawed from the start, missing key ingredients that had been purposefully removed. Superman Reborn restored some of those ingredients, when Superman altered reality in joining Pre-Flashpoint and New 52 Superman, but since then, readers have been told, directly by Superman no less, that something is coming. Something is looming on the horizon, and while readers cannot see it, DC definitely wants us to anticipate and feel it. Crisis on Infinite Earths birthed a new DC universe by making the previous one irrelevant. DC tried to do that once more, but readers would not take to it, Superman readers most of all. Now, readers are being directed down the road of crisis once more, and one has to ponder as to how much will be made irrelevant this time around. It was said that Superman would be needed to effect the right outcome of this story, that the stones said only Superman could do it. What was it that Superman actually did? He released an onslaught of heat vision and destroyed a big machine. That's it. There was no one else on the League who could destroy a machine. Not Cyborg, the obvious choice, Green Lantern, or Batman with bomb. Hitch's love of Superman is apparent, but while he is ready to put Superman in the centre of a story, Superman has little to execute. He's been sent to the Earth's core, punked by the Enchantress, and made into a ray gun that would make Flash Gordon swoon, but none of these actions move the needle. They don't live up to the power and ability of the Man of Tomorrow. Time being what it is, readers' will wonder why Superman is so integral to the League or the DC Universe, when he's called on to do the elementary. Art - 4: While Superman is a glorified ray gun, it's illustrated well. The scope that's given to the heat vision, so we can see just how large and powerful the blast is, pulsates to the point you can feel the energy on your fingertips. 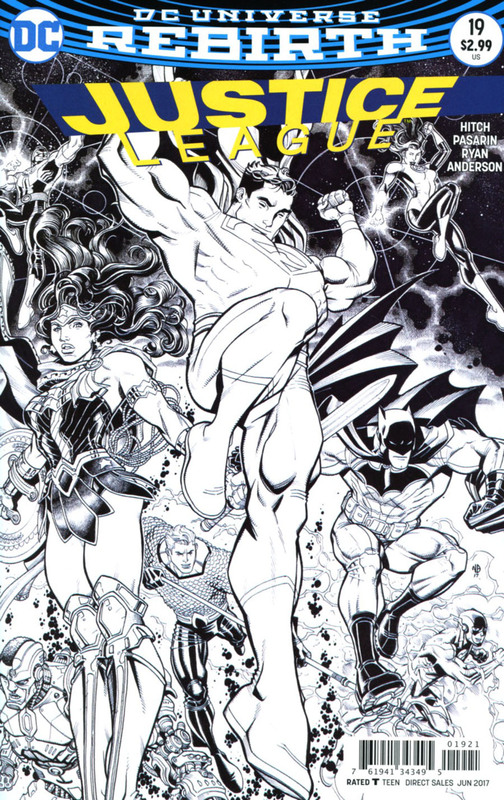 Cover Art - 3: Another homage cover, or at least one reminiscent of the Copper Age Marvel covers. Alpha Flight and X-Men in particular. Variant Cover Art - 3: Where did all the color go?